There’s only 2 little weeks left until Halloween, but that’s still plenty of time to transform your home into a trick-or-treater’s best nightmare. Take these DIY wreaths, for example. 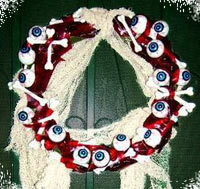 While the wreath is typically used around Christmas time, this makes it perfect to transform for ghastly Halloween usage. People expect traditional pine boughs and red ribbon when they think of wreaths, and you can catch them off guard with spooky adaptations that include monster fur and fake gore. It is the ability to change the mundane into the macabre that has made Halloween so popular. Both of these projects are incredibly simple, and don’t require sewing. Just a quick trip to your local Halloween store or Joann’s, and about an hour of construction and you’ll have a Halloween wreath that’s far creepier than anything available at the stores. 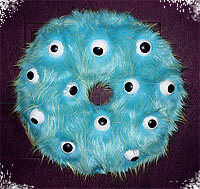 There’s also a tutorial for a Trinket Wreath at Craft Bits that’s as easy as plugging in a glue gun. For more inspiration, there are some unique Halloween wreath images on Google, as well as some creative takes on the Monster Wreath on Flickr. Have you made a Halloween wreath or found a good tutorial online? Please share the details using the comment form below. Subscribe to comments with RSS or TrackBack to 'DIY Halloween Wreaths'. I used one of those grape vine wreaths that all the craft stores sell, spraypainted it with flat black tremclad, aded some torn cheese cloth, bugs and a bat. really quick and easy project,so easy kids could do it. I’ve been preparing a Halloween post about my childhood experiences and taking spooky photos lately. Hope you drop by later and check it out.